Chancellor George Osborne has laid out his ambitions to make Britain “the technology hub of Europe”. Chancellor George Osborne has laid out his ambitions to make the Britain “the technology hub of Europe”. Osborne committed an "above the line" R&D tax credit from April 2013 with a minimum rate of 9.1% before tax. Loss-making companies will be able to claim a payable credit. The government said it will be consulting on the detailed design of the credit. There will be an additional £50m to fund a second wave of 10 smaller super-connected cities, to complement the 10 major cities announced in the autumn 2011 pre-budget statement. From 2012 the government will publish all its information through the single "gov.uk" domain name by the end of 2012, and will move to a "digital by default" approach to transactional services by 2015. The government "will transform the quality of digital public services by committing that from 2014 new online services will only go live if the responsible minister can demonstrate that they themselves can use the service successfully." It will extend mobile coverage to 60,000 rural homes and along at least 10 key roads by 2015. The government will also consider whether direct intervention is required to improve mobile coverage for rail passengers. The Carbon Reduction Commitment energy efficiency scheme will be reviewed to reduce administrative burdens on business - something which could affect companies owning or using datacentres. Corporation tax will be cut by an additional 1% from April 2012 to 24%. By April 2014 it will fall to 22%. The government will consult on doubling the individual grant limit to start-ups to £250,000, with the potential to help young people to get loans to set up their own businesses. Administration of tax for small firms with a turnover of £77,000 is to be simplified, which Osborne claims will help three million firms. It will introduce corporation tax reliefs from April 2013 for the video games, animation and high-end television industries, subject to state aid approval. Osborne identified the 10 large cities that will get ultra-fast broadband and Wi-Fi – following his £100m commitment in his Autumn Statement. The funding will go to Belfast, Birmingham, Bradford, Bristol, Cardiff, Edinburgh, Leeds, London, Manchester and Newcastle. 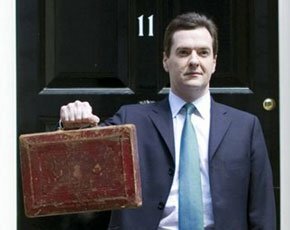 Read all our Budget 2012 coverage here. performance and minimising expensive down time. consumption effectively: they cannot track spikes in demand; identify the least efficient devices; the servers that are redundant yet still consuming power; or reliably assess the potential value of new, theoretically more efficient technologies. such monitoring in place, organisations have early warning of potential problems – such as an air conditioning leak – that could cause downtime. The world is running out of power at the same time as demand is spiralling. Of course, something has to give. But is CRC really the answer? Organisations need to focus on saving money and improving performance – with the right approach, carbon reduction commitments will be met by default.